It’s been a while since we last looked at the Season Visualiser – an initial idea to re-visit it every month was probably a little too ambitious – but an update right now uncovers some interesting results. For the sake of simplicity, this post will look at the visualiser’s accuracy to the end of October, and how Blackpool’s season may look like panning out. To begin, let’s take a look at how successful the visualiser was at predicting the results in the months of September and October. As before, the visualiser indicates the potential outcome from a dark green for a sure-fire win, to a dark red for a likely defeat, without every shade of yellow in between for the harder to call fixtures. Illustrating the actual results, green indicates a Blackpool win, yellow a draw and red a loss. If results had gone more or less as predicted, ‘Pool would have likely drawn three and won one, taking six points from September. As it happened, the Seasiders won only five points that month, but not necessarily in the predicted games. A win against Ipswich began the month well, but defeat away to Portsmouth, followed up by a disappointing draw at Coventry rounded off a slightly below par performance. The results in October went much more as anticipated by the visualiser. Victories over Bristol City and Doncaster straddled the somewhat humbling defeat at the Boleyn Ground – anybody using this visualiser as a betting aid would have done fairly well on the back of the first three games of October. A home loss against Nottingham Forest was a little unexpected, but the 3-1 defeat at Burnley could be more easily understood, however poor the performance was on the day. In the introductory Season Visualiser post, I unveiled how the system could be illustrated month-by-month in graph form. With a few months now under our belt, we can take another glance at the graph to see how accurate it was. Adding a second axis to the graph indicating points per game, we can chart the progress so far. Astoundingly, the season so far has shaped up almost exactly in line with how the visualiser suggested it might. From averaging 1.6 points per game in August, that dropped to just 1.2 points per game during October. Luckily for ‘Pool, and unfortunately for the visualiser, the predictive element is about to come to an abrupt end. With two back-to-back victories to open November, even defeats in all of the remaining games this month would see the results line plateau at 1.2 points per game. That said, the three upcoming games do look particularly tough and so an upward turn in the points per game line is by no means guaranteed. Analysing how the Seasiders are getting on in terms of their end of season goals – a play-off place is the realistic target – we can return to the end of month points tally chart. The targets are based on generally accepted averages for various end of season outcomes, but weighted for each month depending on the relative difficulty of the fixtures. So far, Blackpool have ended each month somewhere between the survival and play-off targets, which up until the end of October was probably a fair assessment of how the season looked like progressing. Ending October four points off the play-off average, over-performing in November was a must in order to avoid falling away prematurely. It is vital that any club hoping to make the play-offs is still within touching distance around the time of the January transfer window, just as Blackpool were two seasons ago. Two-fifths of the way through November, ‘Pool find themselves on 25 points, five shy of the play-off target. If Ian Holloway’s team can get anywhere near the 30 point mark by the end of November, it will have been a fantastic month for the Seasiders, and with kinder fixtures to follow in December and January especially, promotion aspirations may start to look more likely. 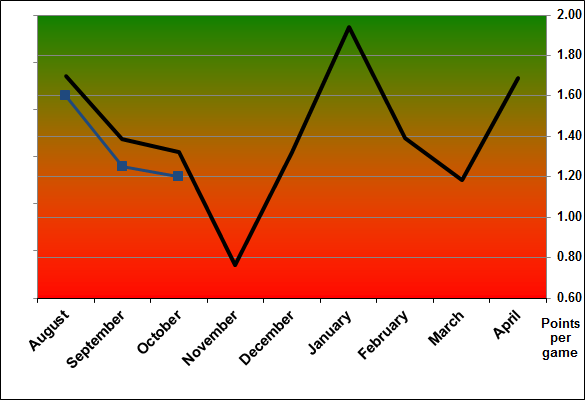 I’ll revisit the visualiser again early in the New Year, by which time the season should be more clearly defined.